On December 1, 2017, the 10th International Conference on CSR Reporting in China, which was co-organized by China WTO Tribune, China Business Council for Sustainable Development and the CSR Center of Swedish Embassy in China, was held in Beijing. The “GoldenBee Excellent CSR Report 2017” was released at the conference. China Machinery Engineering Corporation 2016 Social Responsibility Report and SINOMACH 2016 Social Responsibility Report won the “Evergreen Award of GoldenBee Excellent CSR Report 2017”. 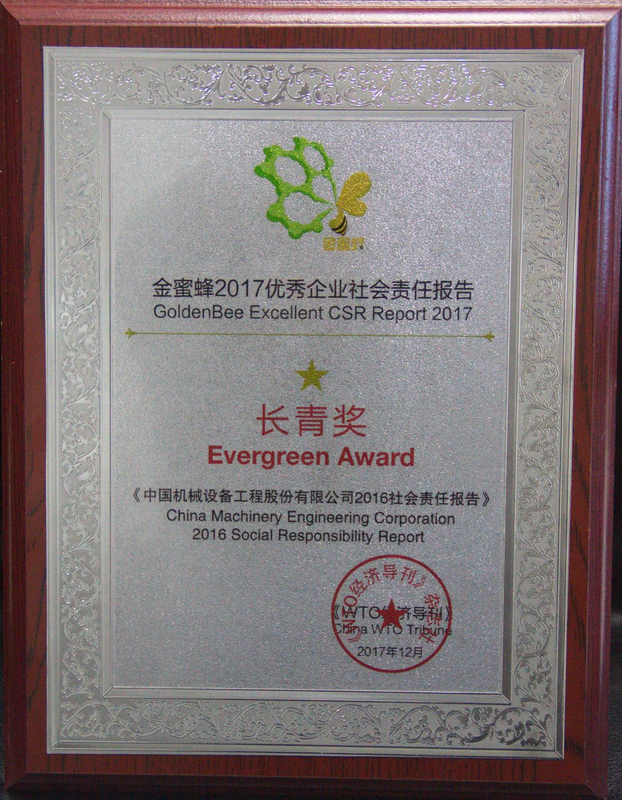 As the top honor in the honor roll of GoldenBee, the “Evergreen Award of GoldenBee Excellent CSR Report 2017” is for those reports winning “GoldenBee Excellent CSR Report” for three consecutive years, keeping a high standard and winning universal praise from interested parties in the year. Based on the “Evaluation for GoldenBee Excellent CSR Report 2017” (hereinafter referred to as “GBEE-CRAS2017”) of China WTO Tribune, the event aims to make an independent, objective and comprehensive evaluation from a professional perspective on the CSR reports in terms of substantiality, completeness, credibility, readability, comparability and innovativeness. A systematic analysis and evaluation was made on the 1,433 CSR reports that were released in mainland China in the first 10 months of 2017. 72 companies were included in the honor roll. As one of the most authoritative list for CSR assessment in mainland China, the honor roll has been released for 10 consecutive years by the end of 2017.